The launch of a new engineered clean agent total room flooding system that has just received UL Listing means that total room flooding installations no longer have to be more complicated than necessary. Installation costs can now be drastically reduced, previously unattainable design flexibility is also a reality; and installation times have been slashed. The new engineered clean agent total room flooding system from Firetrace International achieves much of its success by optimising the “industry standard” flow calculation method in order to exploit the superior flow characteristics of 3M Novec 1230 Fire Protection Fluid. It delivers a host of substantial and measurable performance enhancements when compared with traditional delivery systems. These include superior performance, greater flexibility, improved value, speedier installation and a measurable competitive edge for system installers. Compared with traditional clean agent total flooding systems, the new E4 system from Firetrace International requires between 25 percent and 40 percent less piping; delivers a 300-plus percent increase in the horizontal cylinder-to-nozzle distance; the vertical distance is increased by more than 400 percent; and there is a 700-plus percent increase in liquid agent to pipe volumes. The result is the largest possible networks without the need for extra equipment, and lower hardware cost for every square meter of area protected. The new UL Listed engineered clean agent total flooding system takes full advantage of the unique characteristics of Novec 1230 fire suppressing agent. Novec 1230 is a next generation Halon alternative that provides outstanding performance, a large margin of safety for occupied spaces and an excellent environmental profile. It is the first Halon replacement to offer a long term, sustainable technology for special hazards fire protection. The E4 total flooding systems utilise the latest 34.5 bar total flooding technology that provides impressive performance gains compared with traditional total flooding systems, many of which use conventions developed for Halon systems in the 1980s; conventions that were continued by many HFC and Novec total flooding systems. The risk of fire is very real in data centres or IT facilities; faulty electrical connections, short circuits, thermal overload and power line surges are just a few of the many causes of fires. 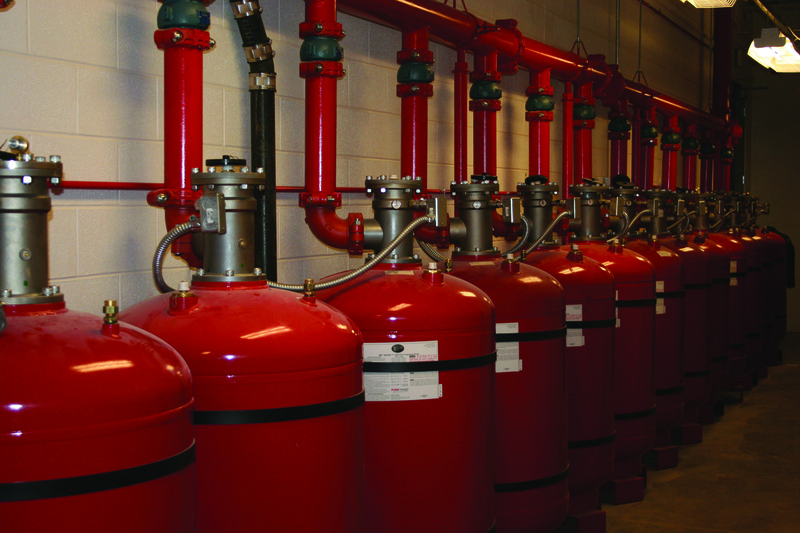 Quick detection and suppression of a fire is critical for reducing or eliminating downtime. However, it is also critical that the fire suppressing agent has no adverse effect on data centre operations. Firetrace’s new total flooding systems use “clean” fire suppressing agents such as Novec 1230. The term “clean agent” is commonly used because these agents leave behind no residue and cause no collateral damage. Clean agents such as Novec 1230 are electrically non-conductive, non-corrosive and can safely be discharged on energised equipment located in occupied areas. Systems are available in eight capacities with fill volumes ranging from 4 kg to 590 kg – the largest cylinder in the industry (the UL Listing applies across the entire range of charging capacities). They offer higher agent fill density (more agent in the same size space) and are capable of massive piping volume capabilities without the need for expensive N2 drivers and are available with stackable actuator systems, so the remote storage of cylinders is no longer a challenge. All cylinders can be under-filled in one kilogram increments to meet the exact amount of Novec 1230 required. Nozzles are available in centre and side discharge patterns for pipe sizes ranging from 12.5 mm to 64 mm. The systems can be activated either manually or automatically using mechanical, pneumatic or electrical activation. The number of tees and nozzles is greatly reduced and the challenge of having to accurately equally balance the amount of agent at Bull T and Side T connections, plus extra pipe lengths between tees are either minimal or completely unnecessary. With E4, the Bull T split can be up to a 90/10 split, while the Side T can be up to 50/50 and 93/74 split. The result is an installation that can show more than a 50 percent saving on labour costs through “smart” pipe layouts that are impossible to achieve with the design limitations inherent in old-technology systems. System installers’ end-user customers also benefit, achieving a much lower financial outlay when compared with other systems on the market, and greatly improved design freedom. For example, with conventional systems the maximum possible cylinder-to-nozzle distance is frequently little more than 20 meters to 25 meters. This often means that cylinders have to be located in the room being protected. However, with E4 the distance benefits associated with inert gas systems are now achievable with Novec 1230. It is now possible to protect an entire facility from a single bank of E4 cylinders. In fact, by merely replacing the cylinders and nozzles, E4 provides a swift, least-cost transition from most existing Halon systems to Novec 1230 clean agent technology. Recognising the need for effective protection against the risk of fire, the USA’s Social Security Administration’s (SSA) new 27,871 square meter National Support Centre in Maryland is protected using Firetrace International’s new advanced UL Listed E4 engineered clean agent total flooding system. Utilising more than 40,820 kg of 3M Novec 1230 Fire Protection Fluid, the system easily rates as one of the largest “clean agent” total flooding systems ever installed. A total of 128 Firetrace E4 clean agent cylinders have been installed, each of which is capable of holding up to 590 kg of Novec 1230 Fire Protection Fluid. The cylinders are deployed in 24 banks that are protecting 12 separate zones throughout the Centre. The Social Security Administrations oversees 460 million records of earnings and benefits for 57 million social security beneficiaries and 160 million workers. According to SSA, an hour’s shutdown would cause serious repercussions; an extended system outage would have national implications. 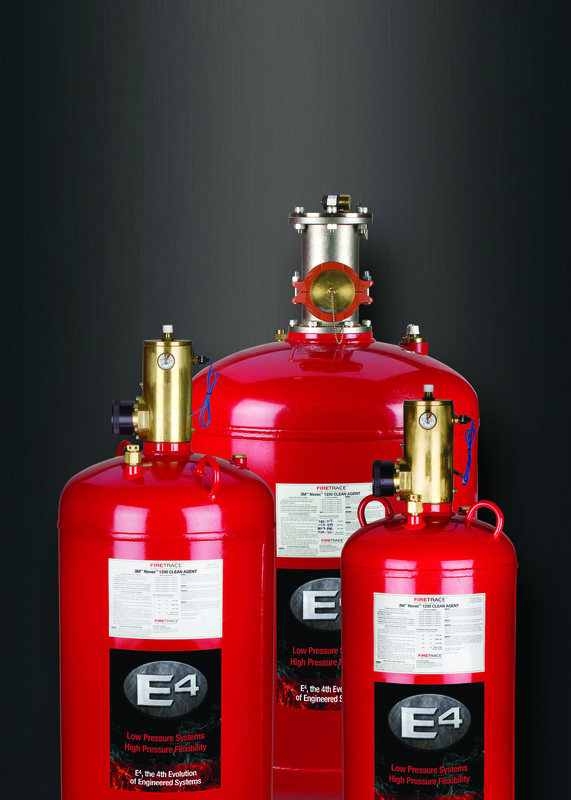 Firetrace’s E4 complies fully with every aspect of NFPA 2001: 2012 (Standard on Clean Agent Fire Extinguishing Systems) and the European standard BS EN 15004:2008 (Fixed firefighting systems. Gas extinguishing systems. Design, installation and maintenance). The system’s cylinders are also UL Listed and are manufactured, tested and stamped in accordance with DOT 4BW500 or DOT 4BA500. E4 systems are manufactured in an AS9100C/ISO 9001:2008-certified facility. They are compatible with most popular releasing panels. Firetrace also offers DuPont FM-200 total flooding systems.